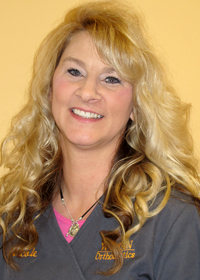 I greet our patients with a warm smile when they arrive for their visit. I want them to feel comfortable while they’re here. I also want them to know that we are concerned about them as individuals and will do all we can to ensure that they have a positive experience while visiting us. 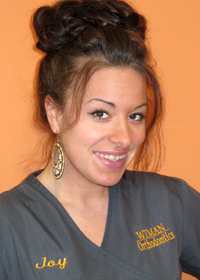 I always have time for a quick chat with our established patients and love getting to know our new ones, too. 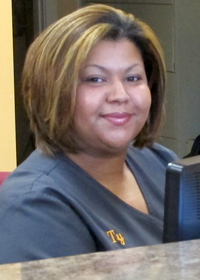 In addition to welcoming our patients, I also handle the check-in and check-out, and am available to answer questions. In fact, all our team members are available to answer questions and respond to concerns that a patient might have: we believe it’s essential that someone we are caring for feels comfortable communicating with us. As for my personal life, away from work you’ll most often find me spending time with my family and friends. Enjoy working with such a great group of people who are dedicated to helping our patients feel better about their appearance and health. It’s a lot of fun to spend each day interacting and being social with such great people! Working from our front desk, I look forward to building great friendships with our patients and their families, and making sure that everybody who comes to our practice feels welcome and comfortable. In my down time, I enjoy spending time with my family. I love working with my patients. Making them smile while perfecting their bite and teeth makes me happy. 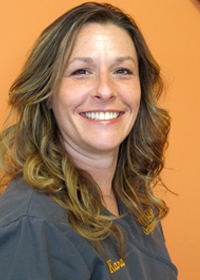 Because orthodontic treatment can take some time, we get to know our patients and their families, and we usually end up becoming friends with those we care for. Our patients are excited when they come in for their appointments; not just because they know they’re getting closer to completing treatment, but because they want to tell us about their latest adventures. Our practice is filled with a lot of smiles and laughter, and it’s a great environment in which to work. My duties involve placing and fixing braces for our patients. Outside of the office, I like being active and you are likely to find me outdoors. I am married and have two children. 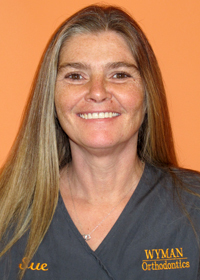 I have always enjoyed working with people, and here at our practice I not only work with our patients, but I help them feel better about their appearance while their oral and body health improves through treatment. Each patient’s needs are unique and we develop treatment strategies that work for their specific mouth. Throughout the course of treatment, while I provide care, I get to spend time with each patient and get to know them as a person. I love it that they come in with stories and jokes to tell; they can be so funny and full of life! The day that we take off their braces and the patient sees their beautiful new smile for the first time, that’s the best day for me. I know that I’ve helped to improve the life of someone who has become my friend and I am happy for them. On a personal note, most of my free time is spent hanging out with my family, preferably in the outdoors. 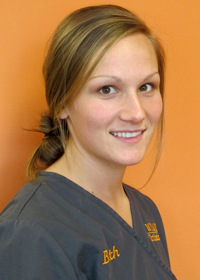 I really enjoy interacting with our patients and getting to know them and their families. They have such amazing interests and experiences, and many of them come in for their appointments just bursting to tell us the latest news. I also very much enjoy the challenges associated with creating and working with each patient’s individual treatment path. The fact that I work in orthodontia, caring for great patients and making a positive, life-affirming change in their lives, while having such wonderful team members, means I smile a whole lot and feel good coming into the office each morning. During my time off, I spend much of my time with my spouse and two daughters. It is amazing that I get to interact with our patients each day. 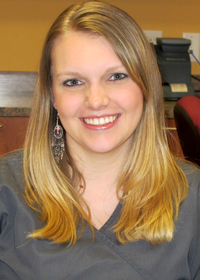 As our team develops their new smile, we get to know our patients, and we become friends with them. It’s a great feeling to be providing gentle, effective treatment for people we genuinely care about. Knowing how important good oral health is, and seeing a patient’s self-esteem transform from shy to confident and outgoing, is very rewarding. I love it that we are able to bring about positive changes that will mean a healthier, happier life for our patients. During my time off, you’ll find me with my three children. I have two daughters and a son, and we all enjoy outdoor activities, including hiking, kayaking, and playing various sports. Our patients are, without a doubt, my favorite part of working here. They are all such amazing individuals with unique perspectives in life. I learn from each of them and we’re always talking and laughing during their visits. This is a very welcoming practice and that’s reflected in our patients: they come in smiling and they leave smiling, because they’ve had a good time while here. I like knowing I’ve played a part in that. Some of my job duties include handling our patient records and working in the lab. In my personal life, I love decorating for all the holidays. Bringing smiles to everyone’s faces makes me smile, and that’s a great feeling. Every day, our patients make me laugh. Whether it’s a joke they just have to share, or a recounting of their latest adventure or misadventure, they often have me in stitches. I love working in such a happy atmosphere and spending my days surrounded by laughter and smiles. 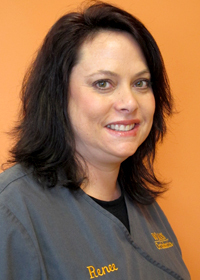 I also love the day that we take a patient’s braces off and they finally get to see their healthy, perfect new smile. I think a lot of our team gets a little bit teary-eyed, because we know that we’ve made a real, lasting difference in the patient’s life, and it’s an honor to be able to do that for someone we care about. My work involves a lot of patient care, but I also handle ordering our needed supplies, too. Outside of work, my passion is cats; I rescue them and then find them perfect forever homes. I also enjoy boating and vacationing. 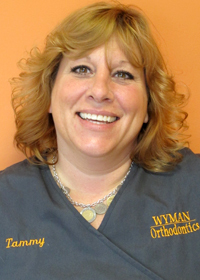 I have been working with Dr. Wyman for the past six years and have been in the orthodontic field for 15 years. It’s great to see the changes in confidence that our patients go through during their treatments. It’s wonderful to see their new smiles, too! I love what I do and feel fortunate that I can say that I genuinely enjoy coming to work every day. At home, I have two sons and I enjoy hanging out with my family. I also love rock climbing! Since joining this practice in 1998, I have so much enjoyed getting to know our patients and helping them feel comfortable at our family practice. The relationships I’ve built with our patients and my team members are very important to me. As our office manager, I do whatever I can to ensure the office runs smoothly and efficiently from day to day. This includes coordinating treatment consultations, billing, and insurance. When I’m not in the office, I love spending time with my large family and cheering for the Baltimore Ravens.